HONORING THE LEGACY After 35 years, legendary Soccer Coach Jorge Tristani retires from teaching. The St. Pius X Athletic Booster Club works to build good citizens through competitive sport. tory of athletics, sportsmanship, pride and success of St. Pius X High School and our students. Est. 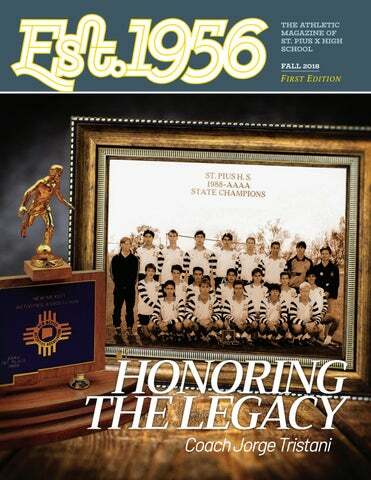 1956 will be published twice a year, in the fall and in the winter/spring and will highlight our teams, seniors, head coaches and St. Pius X High School success stories. We hope you enjoy the inaugural fall edition and will consider being a part of future editions as an advertiser. In addition to Est. 1956, the Athletic Booster Club also oversees the Sartan Shop, coordinates the SPX Sartan Open and hosts craft fairs on campus to generate funds for St. Pius X Athletics. All funds produced from these events/endeavors in combination with Booster memberships, are critical for providing our programs and athletes with top of the line equipment that otherwise cannot be purchased with our limited athletic budget. Thanks to the Athletic Boosters, nearly $60,000.00 has been invested into St. Pius X Athletics since the 2015/2016 school year. From left: Dan Acosta, Cassandra Dennis, Scott Swallows, Tammy Chavez and Santiago Chavez. Fall 2018 After 35 years, legendary Soccer Coach Jorge Tristani retires from teaching. the New Mexico Coaching Community, he describes himself as, “a very average player.” From prep school to graduate school, he continued to play intramurals. In 1973, he became a varsity coach at a boarding school in upstate New York. In 1981, Coach Tristani moved to Albuquerque to pursue his career as an architect. He began playing in a men’s league and resumed coaching with AYSO and Duke City Soccer. That is when he was recruited by a St. Pius X parent to take over a brand new soccer program that had lost its coach after the first season. He was hired on the spot by Coach Ray Giannini and the rest is history. At the time, St. Pius X was a 3A school. 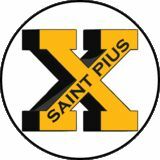 However, from ’82 – ’93, the St. Pius X Sartans played up with the “big boys” in the 4A division, in which time they won three State Championship titles. The first of those titles was 30 years ago, in 1988. Coach Jorge Tristani with the SPX Varsity Team and the Alumni. Over three decades of players are represented. Every year at the end of summer, St. Pius X Athletics hosts the alumni games. Alumni in men’s and women’s soccer and volleyball return to St. Pius X for bragging rights against the newly named varsity teams. However, this year was special! Not only did Coach Tristani retire from teaching after 35 years, but members of the historical 1988 men’s team returned to play in the games. It was a tribute to the great man that influenced them to become everything that he knew they could be with hard work and dedication. During halftime, to commemorate Coach Tristani’s retirement from thirty-five years of teaching and his legacy to St. Pius X Athletics, St. Pius X renamed Coors Fields “Campo de Jorge”. It was a small token of gratitude, paling in comparison to what he has given so many. Campo de Jorge honors the man that shys away from public recognition and would much rather focus on the relationships and memories of his amazing life. Coach Tristani remains the boy’s golf coach at St. Pius X and has won 21 state trophies in soccer and golf. Coach Jorge Tristani and members of the 1988 Championship Team, Steve Pacheco ’89, Michael Strati ’91, Mark Trujillo ’89, Larry Espinoza ’91 and Ted Sweetser ’89. Coach Montoya is a 1995 graduate of St. Pius X. He is 41 years old and married with 2 boys. This is Coach Montoya’s second year as head coach and 20th year coaching football at St. Pius X. Coach Montoya believes that success is rooted in ownership of one’s life. He is assisted by Phil Archuleta, David Ottmar, Matt McCoy ’89. Pete Mora, Matt Wildau ’07, Dallas Peterson and Michael Hyland ’08. Coach Russell is a 2009 graduate of Moriarty High School where she began her volleyball career with two back to back state titles, was a two-time first team all-state setter and named four-time all-district and two-time all-metro in 2007 and 2008. She went on to play for the Lady Lobos at UNM where she received multiple awards and scholarships and served as Team Captain her senior year. Coach Russell is assisted by Isaiah Bradford and Jim Farmer. Left: Francesca Bell, ’20 Right: The 2017 5A District Champs in another nail biting win on the road to state. Left: Coach Russell and Assistant Coach Isaiah Bradford strategize on the sidelines. off the field. establishing a community of coaches	parents and alumni that are proud to support the growth and development of confident young men. He is assisted by Jason Maestas ’04. The Sartans gather for a pre-game huddle and prayer, "St. Pius X, Pray for Us!" Coach Sullivan is a 2002 graduate of St. Pius X High School. Coach Sullivan is pursuing a degree in Exercise Science. He has studied Coaching Performance in Football (Soccer) at Anglia Ruskin in Cambridge, England. Coach Sullivan was a national runner up for the assistant coach of the year in 2014 and 2015. He was assistant coach of the year for the Western Region in 2014 and 2015. Coach Sullivan’s coaching philosophy is centered on leadership and morality. He is assisted by Stefanie Tierney ’97 and Abby Tarin ’09. seeking the good in all situations. Coach Turcotte has been coaching at St. Pius X since 1988. He is also the Director of Marketing and Enrollment. It is often said about Coach Turcotte that he bleeds black and gold and breathes St. Pius! Running has been a lifetime commitment for Coach Turcotte. He is assisted by Gabe Aragon and Neil Silver. Below: Our seniors: Andres Vigil ’19	Eva Garcia ’19, Davin Ruggles ’19, Sarah Otero ’19, Santiago Montoya ’19 and Maya Martinez-Metzgar ’19. Right: The girls group: Christy DeGuio ’20, Sarah Otero ’19, Katerina Gallegos ’18, Davin Ruggles ’19, Amanda Salas ’18, Carisa Salcido ’21, Emily Valdez ’21, Isabella Clark ’21, Teresa Moorhead’ 18, Santana Larranaga ’18. and who can also dance. Coach Marlene Barela has coached high school, middle school, and all star cheerleading for over 16 years in Colorado and New Mexico. She has been the head coach at St. Pius X since spring of 2016. Last year, was the first year that the cheer team attended state with Coach Marlene and together they accomplished a noble 6th place in a very tough division. Her dedication to the cheerleaders is immeasurable with a goal for the program to build a solid foundation and to provide growth. Coach Marlene truly believes that every athlete can be successful, in the right position. do it, because I love it! The 2018/2019 Varsity Cheerleaders prepare for the upcoming school year. There is no doubt that my education here was outstanding, but I attribute part of my success to being on the Dorados Dance Team. Dorados taught me motivation, the value of hard work, how to accept criticism, self-confidence, flexibility (both physically and in life), time-management, teamwork, and the importance of being involved! God has blessed me with the opportunity to coach these amazing young women, so I am committed to my primary coaching objective which is to help develop strong	confident, independent women who are active in their communities. get. Coach Gina is assisted by Marissa Avila ’11. The 2018/2019 Dorados Dance Team strike a pose at the 2018 Universal Dance Association summer camp. Juanita Marquez uses the latest technologies to create a teaching clinic for SPX athletes and students. uanita Marquez has been the Athletic Trainer at St. Pius X High School since 2009. During this time, she has worked to establish one of the most recognized sports medicine programs in the state. Students who partake in this semester long sports medicine class are exposed to taping, modalities, injury assessment and evaluation, rehabilitation programs, first-aid procedures and head/ neck injury management. Sports medicine students learn first-hand how to evaluate for injuries and provide treatment to help return the athlete to play. The program is unique because students are required to obtain clinical hours. They must work in the training room and at sporting events as part of the curriculum. This allows students hands on experience about the topics which are being covered in the class. With the constant changes in healthcare and medicine, Ms. Marquez is consistently looking for new products and new technologies which we can bring to the over 300 student-athletes at SPX. Ms. Marquez states, “In the 9 years I have been at St. Pius, we have expanded our training room to meet the demands of our students and bring in the latest tools for treatment and care. One of the most recent additions to the training room is the new GameReady Med4 Elite Unit. The Med4 Elite Unit is a multi-modality, dual-user recovery system. This touchscreen unit integrates iceless cold, controllable heat, rapid contrast, and active compression therapies like never before. I now have the ability to provide comprehensive and flexible treatment options for diverse injuries, post-surgery recovery, and different stages of rehabilitation. This contributes to the ultimate goal of returning our athletes to play as quickly and as safely as we can.” Ms. Marquez teaches sports medicine in the fall and the spring semesters and supports every sport at SPX including summer training sessions. SPX Alumnus, Michael Statzula ’18 and Senior, Danilo Padilla ’19, demonstrate the new GameReady Med4 Elite. Seventeen SPX Athletes move on to college sports. From the top: Sarto and Arianna Martinez ’18; the Chavez Family; Julian Garcia ’18 and Alex Nana ’18; The Garcia Family and Coach A.J. Herrera ’99 Below: Class of 2018 Signing Day Sartans! The 17th annual tournament raises more than $27,000 in support of SPX Athletics. he 2018 Athletic Booster Club Sartan Open was held on May 4, 2018 at Los Altos Golf Course and raised more than $27,000 to benefit Sartan Athletics. We want to thank Chris Moya, SPX Girls Golf Coach and golf professional at Los Altos for all of his assistance in making the tournament a huge success as well as the nearly 100 golfers and event sponsors that supported the tournament. See you in Spring of 2019 for the 18th Annual Sartan Open! The New Mexico 5A State Champions. Jordan Martindale ’18, Shamyra Sanchez ’18, Ashlee Garrett ’18, Kori Tellez ’18, Coach Roy Turpin, Cindy Herrera ’18 and Sarah Brown ’19. SPX Alumna Haley Rizek ’18 is named New Mexico Gatorade Player of the Year. PX Alumna, Haley Rizek ’18 was awarded the New Mexico Gatorade Player of the Year in Track and Field for the second year in a row in 2018. Haley, a well-rounded student and athlete was recognized for not only her athletic achievements, but also her academic success and strong character. An active member of her school’s campus ministry mission, Rizek led a Make-A-Wish Foundation of America campaign that raised over $10,000 in a single week. Mexico’s fastest times in the 100 and 300 hurdles times last spring, including an all state record and personal-best 14.39 in the former, and her PR in the javelin ranked as the nation’s No. 95 throw in 2018 among prep competitors at the time of her selection. She graduated as a four-time state champion in the 300 hurdles. In the classroom, Rizek maintained a 3.72 GPA and is attending the University of Pennsylvania, where she will compete in track and field. Haley Rizek broke the state record in the 100m hurdles in preliminaries, her time was 14.39. Another 1st place victory for Rizek at the 2018 NM Track and Field State Championship. The Booster Club saw a need for the store, and students beat a path to its door. and began providing our students with school uniforms. As time went on, it became apparent that the small office in the gym could no longer accommodate the needs of a full service store and in 2015, it moved to its current location in St. Jude Hall adjacent to the student parking lot. The approximately 800 square foot store sells school uniforms, spirit shirts, sweats, caps, mugs, ties and all things Sartan! The store is run by one full time employee and several volunteers. All proceeds from the Sartan Shop benefit the St. Pius X Athletic Booster Club. Steadfast Performance provides a safe environment for athletes young and old to achieve their optimum levels. n 2016, after over 3 decades of teaching Physical Education and overseeing the St. Pius X weight room, Pat Weiss, a legend in the St. Pius X community retired. As a result, there became a need to provide a safe environment, certified trainers and instructors to our young athletes. In the fall of 2017, Steadfast Performance was founded to fulfill that need. Steadfast Performance was created by Trey Casaus, a 2012 graduate of St. Pius X and Roman Escandรณn. Casaus and Escandรณn have spent their lives exploring sports performance coaching. The mission of Steadfast Performance is simple, to help keep athletes, former athletes, and future athletes healthy, strong, and able to perform their absolute best in sport and in life. Coach Escandรณn demonstrates core strengthening with the girls soccer team. Above: Coach Casaus focuses on strength and technique during morning summer workouts. Below: Coach Julian Pedroncelli spots Junior Amber Baker. Members of the girls soccer team perform the power medicine ball toss to increase power and strengthen their core. Academy, where he has consulted on sports readiness and movement-based injury prevention programs. Coach Escandón’s coaching philosophy is centered on training hard and smart while having fun. He aims to prepare amazing people to do amazing things. Coach Escandón is a Certified Personal Trainer, Performance Specialist and Mobility Specialist and is currently working on a certification as a Strength Coach Specialist. Call 505.275.1000 today! For Home, Auto, Life and Business. Restrictions apply. Discounts may vary. Not available in all states. See your agent for details. Insurance is underwritten by Farmers Insurance Exchange and other affiliated insurance companies. Visit farmers.com for a complete listing of companies. Not all insurers are authorized to provide insurance in all states. Coverage is not available in all states. At the close of the 2018/2019 school year, St. Pius X High School looks forward to acquiring St. Clare Hall, adjacent to Ben Rios Field.